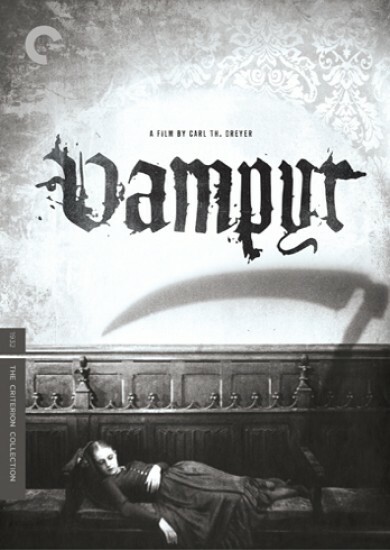 Vampyr is a horror film set in the present. A young man, Grey (David in the French version, Allan in the German), arrives one night at the village of Courtempierre. His sleep is disturbed by ghostly apparitions and he wanders out into the luminous, misty night. In an abandoned factory-like building he sees dancing shadows and the creepy old woman who rules over them. Grey follows the shadows to a nearby castle, where one of them shoots the castle's lord. The old woman, a vampire, bites Léone, the eldest of the lord's two daughters, while the youngest, Gisèle, is seduced by the vampire's helpers. Falling asleep, Grey witnesses his own funeral. After he wakes up, he helps an old servant drive an iron stake through the vampire's heart. Grey frees Gisèle, while the ghost of the dead castle lord frightens one of the vampire's helpers to death and makes the other flee into an old watermill, where he is trapped. The millwork starts up and he suffocates in flour. Grey and Gisèle cross a river and head for dawn on the other side. Dreyer shot the whole film on location. Though reality isn't stylised, as in The Passion of Joan of Arc or German horror films of the 1920s, Dreyer still conjures a pervasive nightmarish atmosphere. We follow Grey through the entire film, but Dreyer opts for angles that make it hard to see the full picture and prowling camera movements that create a mood of danger lurking right outside the frame. The ominous eerieness is underscored by hazy photography, numerous death symbols, frequent dream sequences and many unexplained supernatural phenomena. Principal photography took place between March and October 1930. The film was shot without sound, and the actors spoke their relatively few lines in French, German and English, so that their lips could be matched to the soundtrack which was added later. Practical problems delayed the film's release, not least because Dreyer as an independent producer had a hard time getting access to the necessary sound technology and distribution. The film was generally rejected as avant-garde and weird when it finally premiered, but it has since found a place among the most original works in the horror genre.